Could there be anything better than uncovering a priceless classic sitting lost in your garage? Jalopnik readers know the ten greatest barn find fantasies ever made real. Before we go on, let us say that for every real story of an amazing barn find, there are a dozen fakes, none greater than the Portuguese barn find legend. Autoblog covered these myths a few years back. They all have in common the story of a New Yorker's retirement gift to himself – a house on a few acres in Portugal. The house he found had been vacant for 15 years, the owners having passed away leaving no heirs. The property was being sold to pay back taxes owed, and besides the house, there was also a large metal barn on the land with its doors welded shut. Nobody took the time to see what was inside, so the property was sold as is. When the new owner and his wife arrived, they got to work opening up the barn and found - the barn find of the millennium. Inside the structure sat around 200 dusty classic cars. What an unbelievable bit of luck for the new owner! And we do mean unbelievable. Of course the whole thing was a net hoax, but some people still want to believe it is true, and so the story continues to circulate. After all, there's a whole gallery of dusty classics sitting in a dark warehouse that's pretty compelling. How could it be a lie? Old Cars Weekly just tracked down the story behind the story, and the real explanation is almost as good as the hoax. What we are actually seeing in those pictures is the collection of an automobile dealer who over the years has added many vehicles that caught his fancy. He just drove them to the barn and parked them there, presumably waiting until he decided what to do with the lot of them next. About a year ago he sent in a photographer to document the collection, and those pics are the ones circulating the internet, helping to create and sustain this myth. So don't believe every barn find story you hear, but do believe these. One of the most valuable and historic Mercedes of all time, Rudi Caracciola's 1935 Mercedes-Benz 500K, was found sitting in a nondescript junkyard in South Central LA. Writer Michael Mratz discovered the car, and described its stable mates. A pair of one-off prewar Maybachs; one of two Iso Grifo Spyders (designed and engineered by Giotto Bizzarrini, who also has the Ferrari 250 GTO on his résumé); one of 29 alloy-bodied Mercedes Gullwings, lighter, faster, and rarer than their steel siblings; a couple of BMW 502s and 507s; a half-dozen or so Lamborghini Miuras, with their mighty V12 engines; and the last surviving example of the seven Horch 855 Spezial Roadsters ever built, a specimen once owned by Eva Braun that was for a time on loan to the Audi Museum in Germany. The story of how one family came to own all of these cars, and let so many go to rot, is covered right here. It's the holy grail of '80s performance cars, one of the best collections of youngtimers we can imagine. And it was all locked up in a British barn. A 1960s Dino is not the most expensive car, but it's just so damn cool that the car was literally unearthed rather than simply discovered. The whole story of theft, recovery, and restoration was covered by our own Mike Spinelli right here and on video. While looking on eBay for a scale model of a BMW M1, a kid found a set of BMW M1 body panels. He bought them out of a barn near Munich for 2,000 Euros. It turns out that it was the a genuine March M1 that raced at Le Mans in 1980. BMW the got wind of the find and offered to support the kid in the rebuild. The 2CV might have been a total shitbox, but it was a ubiquitous, highly influential shitbox that helped put Europe on wheels after WWII. The original prototypes were so important to the French auto industry, that they had to hide them from the invading Nazis just before the war, and they remained hidden for nearly half a century before being discovered. This 1949 V12 Ferrari was left in a back yard in Arizona fr 50 years before a Bay Area collector came across it and scooped it up back in 2007. It was valued at a cool $1 million. You have to be rich to buy a V12 Lamborghini back in the day, as Aristotle Onassis certainly was. You have to be crazy rich to buy a V12 Lamborghini, then park it under the Athens Hilton, and then just forget about it. You're looking at the legendary GTO in a field, which sat in a grass field in Ohio from 1972 to 1986. Amazingly, most of the town knew about the GTO and even Ferrari collectors had seen the car since the very early '80s. It just took the better part of a decade for the owner to give up hope of restoring it, even though kids used to "sled ride down the hood" as The Retromobilist notes. There are really no superlatives that don't fit with the legendary Type 57 Bugatti, one of the greatest expressions of the automotive form. One guy found one that had been sitting in a garage for a couple decades and sold it, unaltered, for $4.4 million. Suggested By: Monsterajr, superkiwkizorro, and David Putney, Photo Credit: Bonhams. Some would argue that the Ford GT40 was the greatest American sports racing car of all time, but there's a strong argument that the Ferrari-beating super Cobra, the Daytona Coupe, deserves the title. Only six were made, but for decades, only five were accounted for, as we explained when we inducted the car into the Jalopnik Fantasy Garage. It is true that all six cars were flown from England back to the States, but until 2001 only five were thought to exist. The sixth car? No one knew. Then a woman named Donna O'Hara lit herself on fire. In her locked storage shed, was the missing sixth car, called CSX2287, that her father had purchased years earlier and left to her. 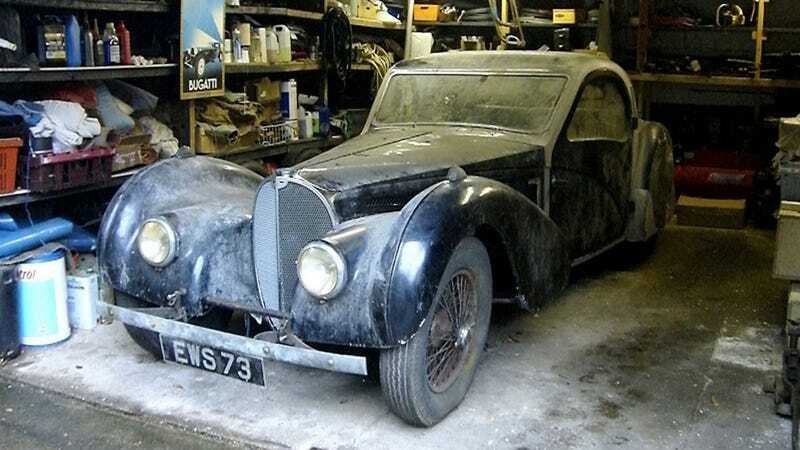 Undoubtedly the greatest barn find in the history of car collecting, its worth is valued at over $4,000,000. Not bad for an initial investment of about five grand.